If you’ve ever been to an Auburn University football game and wondered what all that War Eagle talk was about, fans won’t hesitate to tell you. The War Eagle is one of the most storied Auburn traditions, dating back to the late 1800s, and is a beloved and recognized part of campus culture. When rumor had it that Nova — the soaring star of pregame flights since 2004 — was going to sit out the 2017 season, the community was heartbroken for their longtime feathered friend. Nova, the golden eagle known as War Eagle VII, is too sick to fly this season. The 18-year-old eagle was examined by the veterinary faculty at Auburn University’s College of Veterinary Medicine, and diagnosed with cardiomyopathy, a chronic heart disease. Basically, Nova’s heart has to work twice as hard to move blood around his body and is under strict orders from his doctor to sit out the 2017 season before the condition gets worse. He’ll be resting comfortably in his enclosure at the Southeastern Raptor Center and would likely love a visit during the center’s annual Football, Fans and Feathers program. Did you know “war eagle” is Auburn’s battle cry? The university mascot is actually a tiger, but Auburn University football has had a war eagle close to its heart for over 100 years. While the true origin story is up for debate, there are a few well-known campus legends. 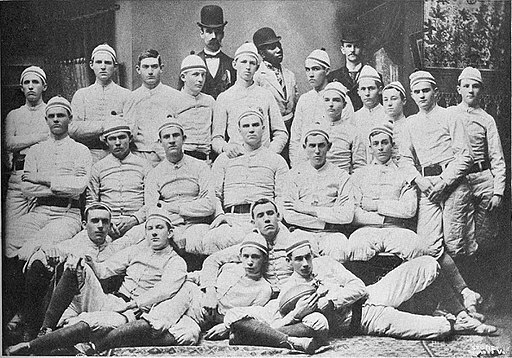 The most popular story revolves around a Civil War veteran in the stands of a game in 1892. He arrived with an eagle on his shoulder, one he found on the battlefield and kept as a pet for 30 years. The eagle suddenly broke free and circled the field as Auburn began to take the lead over Georgia. Spectators chanted “war eagle, war eagle” to root on the team, and the majestic, soaring eagle became a symbol of success and the proud Auburn spirit. A second legend begins in 1914, when Auburn was up against the Carlisle Indians. The toughest player to tackle on the opposing team was nicknamed Bald Eagle, and players would yell “bald eagle” to their teammates, telling them to charge at the target. Meanwhile, avid spectators thought they were yelling “war eagle,” and began chanting it. Another similar story begins when fans would shout “war eagle” every time the Indians scored. When Auburn made the only touchdown of the game for their team, they yelled “war eagle” as they crossed the goal line. Six golden eagles throughout Auburn history have served as the honorary war eagle, the first being the Civil War-era eagle, born from legend. The first live eagle on the Auburn scene was adopted by the football team in 1930–1931 after it had been rescued in Bee Hive, Alabama from a tangle of vines. Auburn football decided he was a fitting match for their storied battle cry, and the eagle was dubbed War Eagle II. 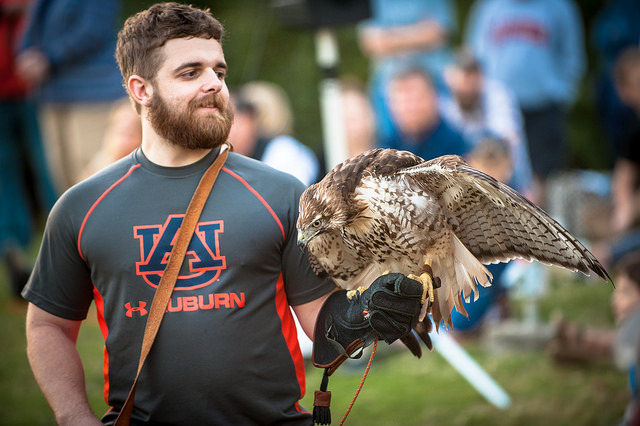 War Eagle III was captured by a farmer in 1960 and donated to Auburn, where it was kept by the Alpha Tau Omega fraternity until the Southeastern Raptor Center was founded. Nicknamed “Tiger,” the eagle was a talented escape artist, and was unfortunately found dead after one of his heists. Not long after, War Eagle IV — also nicknamed Tiger — was transferred from a zoo in Mississippi to an on-campus aviary. This feisty fourth eagle is known for once interfering in a 1976 game when he blindsided an opposing wide receiver in the end zone and earned a 15-yard penalty! War Eagle V was brought to Auburn University in 1981 under the care of the Endangered Species Act. He remained in the care of Auburn University’s College of Veterinary Medicine until he died of natural causes. He was succeeded by War Eagle VI, the first of Auburn’s eagles to take the iconic pregame flight around the stadium. Nova, the current eagle, made his debut as War Eagle VII on November 11, 2006 against Georgia. So what’s Auburn football to do without Nova this season? Spirit, who has been sharing pregame duties with Nova, will take the helm as the War Eagle this season. Every war eagle in history has been a golden eagle, but Spirit is the university’s first bald eagle. He is housed at the Southeastern Raptor Center, an educational and rehabilitation program at Auburn University dedicated to studying and releasing birds of prey. While the community at Auburn mourns Nova’s diagnosis and hopes for his recovery, Spirit is prepared to take on the great responsibility of taking epic pregame flights this season. Auburn football never fear — the tradition continues!